Arrive Delhi by Air or Train and arrives at Volvo bus station, travel overnight in Volvo bus from Delhi to Shimla. After Breakfast Excursion to Kufri. In route green valley covered with Deodar trees, charabra (wildflower hall), Kufri is famous for its Himalayan National Park, Pony and Yak Ride and One can see the endless Himalayan Panorama, after lunch,Excursion to Mashobra, Naldehra, Mashobra is a beautiful village that lies on the road leading from Shimla to Naldehra, The entire valley is covered by dense woods of oaks and pines. One of the greatest places to visit at Mashobra is the Goddess Durga temple. Mashobra attracts tourists for its utmost tranquility. The well known Craignano, fruit research institute, Naldehra is the site of the the oldest golf course in India. The beautiful golf course at Naldehra was the brainchild of none other than Lord Curzon-a viceroy of the erstwhile British Raj. 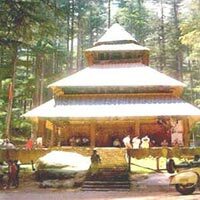 Naldehra got its name from a Nag temple situated inside the golf course. Tall Deodar trees surround the links making it one of the most beautiful golf courses in the world, and back to hotel.,B/H. In the morning checkout from hotel & drive to Manali,in-route Pandoh Dam on Beas River, Hanogi Mata Temple on the bank of Beas river, Kullu is world famous for its handicrafts items, River rafting on beas river ( White water rafting can be organized)and Manali stay at hotel. Excursion towards Rohtang Pass. (up to possible) Solang valley, Kothi a beautiful and last village of kullu district, Vashisht Hot water springs,and B/H. In the morning,checkout from hotel & excursion to local sightseeing of Manali, Hidimba Temple, It is located on a Deodar covered hill in Manali, It is an ancient cave temple, Built over a huge rock, the sanctum is covered by three tiered roof of wooden planks, Tibetan monastery The colorful monastery is famous for its carpet-weaving unit where the residents, the immigrants from Tibet, produce handicrafts of various kinds that attract the tourists towards it,and explore local markets of Manali,and drop at Volvo bus station for overnight journey to Delhi. 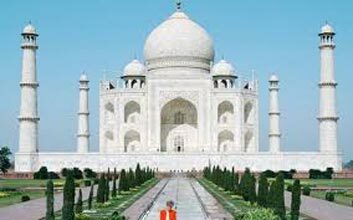 Pick up from New Delhi bus station and drive to hotel, on arrival check in at hotel, afternoon excursion to Agra visits world famous Taj Mahal and drive back to Delhi and stay at hotel. 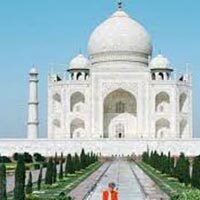 In the morning, checkout from hotel & excursion to local sightseeing of Delhi, Red fort, Qutub Minar, and other famous places in Delhi, and drive to Railway station / Airport and drop, Happy ending of tour.